Adding some storage into your bed frame gives you a clean, modern look. Choosing a bed frame can offer you just as many options as choosing the mattress itself. Since sleep is so incredibly important, you would be right in wanting to look at all the options and to consider all of the possible options. The right bed frame—just like any other piece of furniture—strikes a balance between making your room look right and offering you the functionality you need. 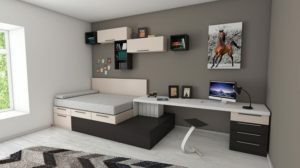 Bed frames with storage built into them certainly offer both of those elements and are a great option for many people. Purchasing a bed frame with built in storage offers you a stylish look with added functionality that you may need. The space beneath a typical frame ends up in two ways a lot of the time. Either it’s entirely wasted space that isn’t used at all or it becomes cluttered. When we go to clean our rooms, it gets easy to toss some socks under our beds, along with books, clothing, and all kinds of things that you were certain you had lost. Instead, taking advantage of a bed frame with built-in storage allows you to take advantage of that space without it getting messy. Just about every bed frame out there is designed to offer stability and support, but that doesn’t mean some don’t do it better than others. Built-in drawers can actually offer even more stability than traditional bed frames do. This is because you’re not resting all of your weight on the mattress posts, it actually distributes your weight more evenly. For those of us who like to load our beds up with tons of pillows and heavy bedspreads, this is useful information to keep in mind! Having the right bed frame is just as important to your room’s design as anything else. This adds a unique element to your room that just isn’t seen often and may set your room apart from all the others out there. This also makes your room just look more organized which is always a good thing.